I have read all of the Virtue Falls novels, including the Woman Who Couldn’t Scream which follows this novel in the series. I’ve enjoyed them, liking the continuing story of the town and it’s inhabitants. There are subplots in each novel that moves the town’s story forward. Even though I read the fourth book before the third, I don’t think I messed up the story’s sequence too much. This novel was still my favorite so far. Each piece came together in the perfect package of psychosis, mystery, and romance. Well done, Ms. Dodd! May I have another? 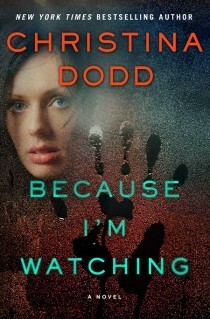 Sign into Goodreads to see if any of your friends have read Because I'm Watching.